Its 1944, deep into World War II. The Allies are pushing back against the Axis powers. But in our historical fiction, we have weaved in the mystic and occult. A limited number of artificers are working for various national powers, industrial progress steamrolling forward due to the push of war. Witches are becoming a worrisome wildcard as Germany delves into the occult, forcing the Allies to turn to the same. Dwarves and elves exist in small minorities, but are as affected by world wide war as anyone else. Think Shadowrun, but in WWII rather than Gibson's Neuromancer. I play an albino unseelie elf. He has lived a couple hundred years in Russia, rich in folk lore like Baba Yaga, Vasilissa the Beautiful, Koschei the Immortal, and more. As an unseelie, he instinctively embraces structure, order, patterns, equality; direct opposites to his spontaneous freewheeling seelie cousins. The hard cold winters of mother Russia suited him well, and the peasants he interacted with added him and his ghostly complexion to their stories. When Marxism and Leninsim gave way to revolution, he was right there along side the Red Guard. The classless ideals of socialism was a natural evolution of his beliefs. Between 1917 and 1944, he served the Party and the Union in its pursuits, not as folk lore but as another equal amongst Russians. He now acts as a veteran on the RKKA and an agent of the NKGB. I really got jazzed by the character concept, doing a lot of research into Russia, their revolution, the idea of communism, the history of the secret police agencies, etc. I originally thought about doing a character journal, with entries for each game, but I decided instead to do a web project. I wanted to weave together the research I did and the events of the games, creating a series of in-character documents. 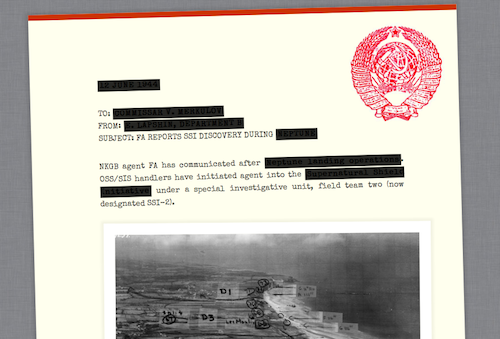 They will be from the point of view of modern times, of historians uncovering documents about the missions our role-playing game is involved in. I hope to expand on the templates to use (german communiques, vatican reports, hand-written letters, etc) and get permission from the other players to use their characters' names/descriptions as well.